Most of this can actually be achieved with the GUI these days, RedHat’s disk utility has improved a lot since the version that was included with karmic. To load it go to Settings > Administration > Disk Utility. 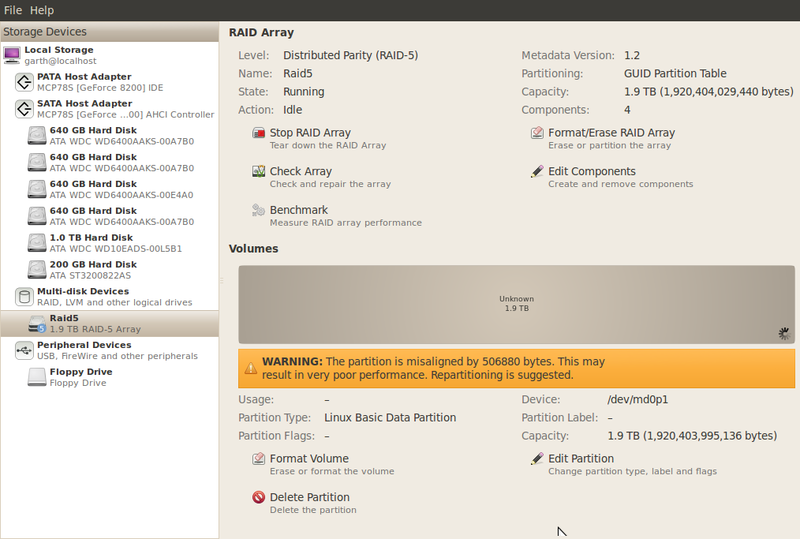 Make sure all the disks to be used have no partitions on them, then go to Create > Raid array. 512KiB was the default stripe size and is what I used initially, but I later switched to a 128KiB stripe. The example below uses a 512KiB stripe. Also, it is a good idea to reduce the size to 128mb or so below the max capacity. Drives of the same advertised capacity can vary slightly in actual size, and if you replace a disk you don’t want the rebuild to fail because the drive is a few megabytes too small. After selecting the disk members and pressing create the array will be in a “degraded” state until all the disks are synchronised. The amount of time it takes depends on the size of the array, but I’d suggest letting it finish before proceeding, I received errors in disk utility if I tried to create a partition too soon. Also note that I’ve used the GPT partitioning scheme. GPT is designed to replace the old MBR scheme which has some limitations and can be restrictive these days, so I elected to use GPT. MBR is a safer option if your array is less than 2TB. If you use new hard drives with 4096-byte sectors such as Western Digital “advanced format” drives, you should use GPT. The use of GPT means that fdisk cannot be used, because it doesn’t support it. In its place we use parted and gdisk (“aptitude install gdisk” if you don’t yet have it). The only slightly tricky part is creating a partition that is aligned with the raid stripe. You can’t create a partition starting at sector 0 because that’s where the partition table lives, so disk utilities will always offset the start of the first partition. However in order to get the best performance you need to align the partitions with the stripe size. It appears that disk utility isn’t quite intelligent enough to create properly aligned partitions on its own just yet. I found the easiest way to get a properly aligned partition was to create a partition in disk utility with no file system, and note the offset given to you by the warning message that appears after the partition has been created. Then, simply delete the partition and use gdisk to create the partition with the original offset plus the figure given to you in the warning. To get the existing offset, run “parted /dev/md0”, type “unit b” to switch the working units to bytes and type p to print a list of partitions on the volume. In my example the original offset was 17408 bytes (34 sectors * 512 bytes/sector), and the partition was out of alignment by 506880 bytes. This means it should actually be at byte 524288, which also happens to match the stripe size of 512KiB. gdisk works in sectors however, so we need to divide the result by 512, giving sector 1024 (524288/512=1024). So in this example you would run gdisk, type n to create a new partition, enter 1024 for the first sector, and accept the default for the last. For the current type I used code 0700, which is “Linux/Windows data”. The second time around I used a stripe size of 128KiB (it seemed more “normal”), and with this stripe you would offset the start of the partition by 256 sectors (131072 bytes). I don’t believe the stripe size matters much – larger stripe sizes probably perform marginally better with larger files but I wanted something more general purpose as there will be a lot of small documents as well as large photos. An example of creating a partition in gdisk follows. Note that I’m using /dev/null in this example to avoid destroying my laptop, you would probably want to use the actual blank raid array, which is likely to be /dev/md0. You can delete partitions with gdisk (with d), but for the newbies it’s probably easier to delete any previous attempts in the gui disk utility first. DATA, YOU HAVE ONLY YOURSELF TO BLAME IF YOU ANSWER ‘Y’ BELOW! OK; writing new GPT table. I haven’t yet investigated tuning an ext4 partition for raid 5 arrays. There are probably some tweaks to be made here, please comment if you have a suggestion. At this point you should have a working raid array, shown as running in disk utility and an ext4 partition on the disk. If you reboot you will notice that the array doesn’t start automatically, you have to go into the disk utility and start it manually each time. Getting it to start by itself also requires falling back to the command line. Make the array is running before proceeding. Paste this line into /etc/mdadm/mdadm.conf, below the line that says “definitions of existing MD arrays”. Reboot, load disk utility and you should see that your array has been started automatically. Note that the UUID here is the UUID of the partition and not the raid array. To get the UUID of your partition, use the command “sudo blkid” and note the UUID of the partition on your raid array, which should be /dev/md0. Another useful command is “cat /proc/mdstat” which gives some info about active arrays. You shouldn’t need to create the mount point in /media, in my experience this happens automatically. This entry was posted in Articles, IT, Linux and tagged home server, linux, lucid, mdadm, raid, ubuntu on May 9, 2010 by Alex. Hey! So far so good! I’m trying to set something up for backups, but my parents aren’t very tech savvy. Hey thanks Bruce, that link is very useful. I was under the misconception that WD Advanced Format drives actually presented 4K sectors, but ‘hdparm -I /dev/sdf’ confirms that this isn’t actually the case so my point about using GPT is moot. Partition alignment however will be critical. Also need to finish the rest of this series, I’ve only just finished setting up the server itself! For us really newbies the rest of the story would make us feel more comfortable. I added the ‘w’ at the end of the Command line and the resulting display and answers required to complete the partitioning action. I am using 10.04. Thanks for that, I’ll add it to the article above. what I found here solved my alignment issues. thank you. I have not been able to have the raid5 mount on boot though. this could be because my drives are external USB2 drives. I dont know. Also the max speed I was able to get is 25MB/second. the drives are brand new WD 2TB drives. 480mb/s usb speed supposedly. What comes to mind to speed them up? 25MB/sec is actually about right for USB2. The 480mb per second speed of USB2 is megaBITS (same way networks speeds are measured, e.g. 100/1000mb ethernet), whereas your OS reports in megaBYTES. So the theoretical maximum of the bus itself is 60MB/sec, and this is shared between all USB devices on the system. If you want better performance I’d recommend using eSATA drives. Hi & thanks, that was useful. however when I get the following warning. 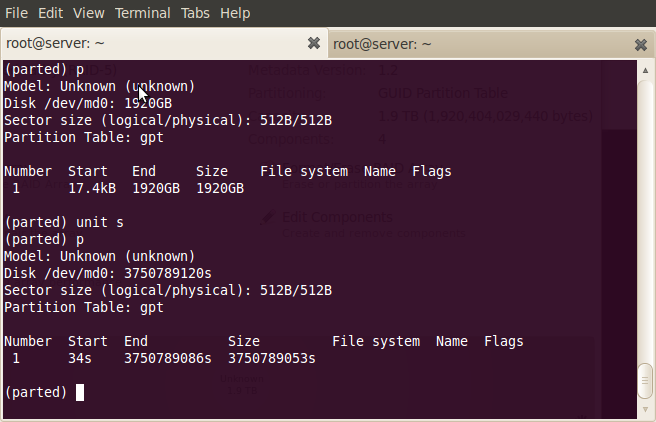 OK; writing new GPT partition table. At this point i’ve rebooted to make the kernel use the new partition table & continued. /dev/md0p1 alignment is offset by 48128 bytes. <- still reported error. Once finished I formated & checked the array again and all was good again, weird no?